Performing nano-scale integration on optical devices has already succeeded in optimising the contemporary data storage systems. The functioning of CDs, DVDs and Blue ray discs depend on a LASER beam which encrypts digital data on an optical disc. With increasing technical advancements, the amount of data recorded per disc increased exponentially. Recently, a group of researchers from the ITMO University in Saint Petersburg has officially introduced a new method to customize light in hybrid metal-dielectric nanoantennas, that will eventually encode ultradense data with controlled input light. Nanoantennas, a device that localises light and compresses it in the nanoscale, overpower electrons in terms of storage capacity, energy efficiency and data transfer speed. They cited a pioneering method in their research paper which talks about incorporation of arrays of hybrid nanoantennas, that can accurately manipulate light according to a predefined program. Owing to the two stage treatment comprising advanced lithography and exposure to femtosecond LASER, nano-antennas have grown to possess extraordinary data storage capacity. The group explained that nano-antennas were the most apt choice to help them fulfill their research objective, as it can gear up data storage capacity and controllability with respect to contemporary data storage devices. Statiscally, contemporary optical devices can store information at a density of 10 Gbit/square inch. Additionally, the hybrid nano-antennas with little modifications could be used in different sectors manufacturing hybrid metasurfaces, waveguides and compact sensors. The internal core of the aforementioned device consists of a truncated silicon cone with a thin golden disk located at the top, in which the device on top could be reshaped as per requirement without affecting the silicone cone. The change, if made, helps to alter optical properties corresponding to the resonance overlap between the silicon wafer and golden nanoparticles (AuNPs). Researchers also explained that the AuNps adjusts according to the intensity of the incident laser beam. Shaped to cup or rod, these modified structures allow the method to engineer the required hybrid nanostructure. Dmitry Zuev, lead author of the study asserted that their research has targeted two interrelated fields namely plasmonics and all-dielectric nanophotonics, which in the future would be proven as a suitable method for data recording and related operations. The complete research has been published in the Advanced Materials Journal. Hai, I just wanna mention about a website that might be very helpfull for job seeking engineers. InfoparksToday.com is a site where you can find all the job openings and news related to all three Infoparks in kerala. Checkout the site and find the job that suits your profile. https://www.infoparkstoday.com/. Nice informative post mam. However can you please help me to understand how these nano-structures are orienting themselves when they interact with light(photons) ? Generally we know that any storage system stores data in binary formats based on their two switch levels (either 0 or 1). How is this happening here? Good to see you here once again. Keeping reference to my understanding of the topic, I would like to offer some explanations to your queries. As you said any optical drive stores data in binary data format, DVDs can store more data than CDs because DVDs use shorter-wavelength red LASER that takes less space when focused and thus encode more information than CDs which use near-infrared LASER for storing data. Here, Hybrid structures are made in nano-range to encapsulate enormous amount of bit pattern in it. Further, in nano-antennas they have treated each button like nanogrid component with LASER, varying the wavelength. This way, it again adds a new parameter using which sets of values can be entered. Ultimately they used the grid component structure in favor of their research. 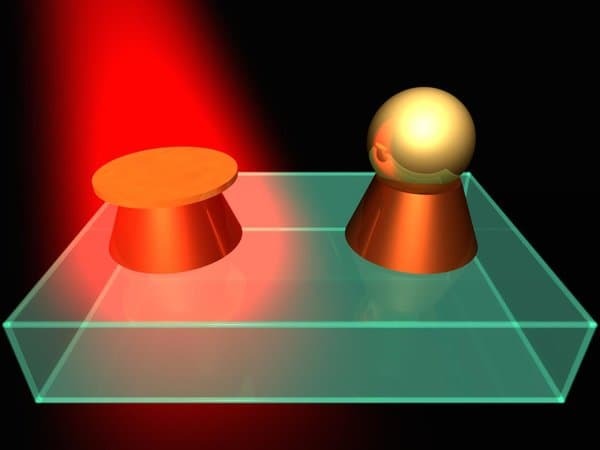 The gold nano particle changes its optical properties corresponding to the intensity of light, each change can further records new sets of information. To simply put, I can assign position of nanogrids as X, wavelength of LASER light as Y and AuNPs optical properties as Z. So if I vary x,y,z in different orientation it is providing me a different permutation result. The whole process working all together to pack information in ultra-dense manner.